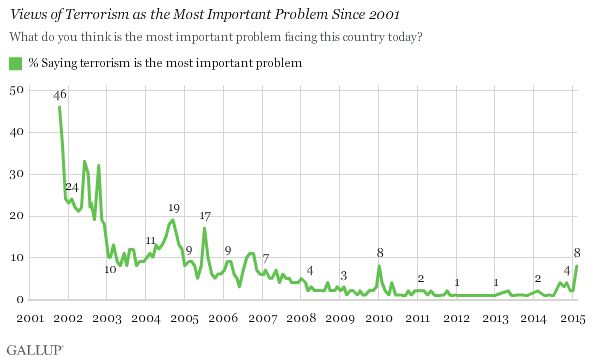 WASHINGTON, D.C. -- The 8% of Americans currently naming terrorism as the most important problem facing the U.S. is up six percentage points since January -- the highest percentage to mention the issue since January 2010. The rise in mentions of terrorism this month comes after the Charlie Hebdo tragedy and more deaths of Western citizens held hostage by Islamic State militants -- including American Kayla Mueller -- in Iraq and Syria. It also follows President Barack Obama's request for Congress to authorize military force against the Islamic State, also commonly known as ISIS, over the next three years. Terrorism was the dominant issue for Americans after the 9/11 terror attacks, with 46% mentioning it in October 2001. This slowly dropped over the following weeks and months, and in February 2009, 3% named terrorism as the top problem. The only other time since then that terrorism showed the type of spike seen this month was in January 2010, a few weeks after a terrorist failed to detonate a bomb on a flight over Detroit. Despite this uptick in mentions of terrorism, it is not the most frequently mentioned problem. 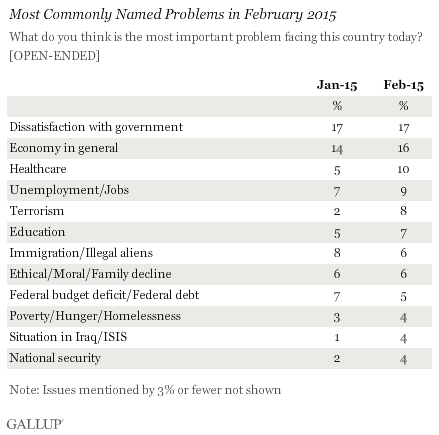 Dissatisfaction with government (17%) and the economy (16%) continue to rank as the most commonly named issues. Mentions of healthcare, at 10%, are up five points from January, perhaps related to Americans' worry about the approaching deadline to sign up for health plans under the ACA legislation. More than 5% of Americans also mention unemployment and jobs, education, immigration and a moral/ethical decline. Most likely related to the same events spurring a rise in mentions of terrorism, there have been modest increases in mentions of national security and the situation in Iraq/ISIS to 4% each. Terrorism and the influence of the Islamic State in the Middle East are on more Americans' minds this month, with increases in the percentage of Americans mentioning all of these problems as the most important facing the U.S. In fact, the cluster of issues including terrorism, the situation with ISIS and national security taken together would essentially tie dissatisfaction with government and the economy as the top overall issue. Whether the heightened concern Americans have about terrorism persists will certainly depend on the amount and nature of terrorist activity affecting the U.S. and its allies in the coming weeks and months. The last American hostage held by the Islamic State was pronounced dead in early February. And recent attacks in Copenhagen are raising fears of home-grown terror attacks in Western Europe and the U.S. Results for this Gallup poll are based on telephone interviews conducted Feb. 8-11, 2015, a random sample of 837 adults, aged 18 and older, living in all 50 U.S. states and the District of Columbia. For results based on the total sample of national adults, the margin of sampling error is ±4 percentage points at the 95% confidence level. All reported margins of sampling error include computed design effects for weighting. In the U.S., 7% mention unemployment or jobs as the most important problem facing the nation, the lowest found since October 2008. Overall, Americans most frequently name the economy in general and government as the top U.S. problem.